Lips are considered to be the symbol of the absolute femininity in a woman’s face. Every woman dreams of sensual, full, fleshy and “juicy” lips. Unfortunately this desire cannot be fulfilled as the years go by. Many women try to increase incorrectly the size of their lips, applying lipstick on the skin above lips. The result is a very disappointing image. The solution for the augmentation and correction of lips is not the lipstick or the lip liner, but rather the contemporary techniques of Plastic Surgery. What happens in our lips as we grow old? Over the years the lips are getting thinner and smaller and they “fall down”. They look like a “withering flower”. The real reason is that the soft molecules inside the lip red pulp are getting atrophic. Consequently the lips “fall down” and they are getting softer, filled with vertical wrinkles. 1. First, the lips lose its former size and shape over the years. The application of lipstick on such lips gives an unnatural result. 2. Second, the lips are getting more atrophic and they look like a thin line, if they have been thin in the past, too. What is the easiest, safest and most controlled way of getting a lip augmentation? Today the augmentation and reconstruction of the lip shape is considered to be very simple and safe. Having in our disposal new injectable materials, we are able to give easily and painlessly the most appropriate volume and shape to the lips. The most predominant injectable implant for lip augmentation is that of the Hyaluronic Acid. The Hyaluronic Acid is not considered to be an “acid” according to the term’s ordinary meaning. It does not “burn” the tissues, since the term “acid” refers to its biochemical substance type. In which case should we do a lip augmentation using Hyaluronic Acid? As it has been mentioned above the image of some women is very characteristic when they try to make their lips more “intense” by tattooing or applying a lip liner either on the skin around the lips or above the lipstick. The result is an extremely unnatural and unsightly image. Are there any rules of harmony about beautiful lips? There are several harmonic rules about lips as well as a special anatomy of the peri-oral region that the doctor has to take under consideration in order to correct the size or shape of the lips. Lips cover the entrance of the oral cavity and they are found above the orbicularis oris muscle, a circular muscle which forms the speech communication. The upper lip is always smaller in size than the lower lip and it has a different anatomy. Specifically the upper lip has two parts, both on the right and left side, which look like «open gull wings “. These two parts of the upper lip are linked together in the middle line, known as the “cupid’s bow”, an anatomical entity called filtrum. The lower lip has a simpler anatomy, composed only by the right and left part. The lower lip is fleshier and has a higher projection than the upper lip. Big and fleshy lips do not suit all faces. Fine facial features, flat cheekbones or small noses, cannot be combined with big lips for “balance” reasons. In order to achieve a pleasant and safe result, it is necessary for the doctor to have a thorough knowledge of the face anatomy and of the aesthetics so as to avoid any kind of exaggeration. Our primary aim when we intervene into the lips is the restoration of the rules of harmony in lips as well in the face. Also it is very important to correct the lip shape and to restore the lost volume in order to have a perfectly natural result. Simply put, our primary aim is not to plump the lips but rather to give them a sufficient volume and beautiful shape, without giving the impression that we had any intervention. The most adequate injectable implant for the lip augmentation is the Hyaluronic Acid. 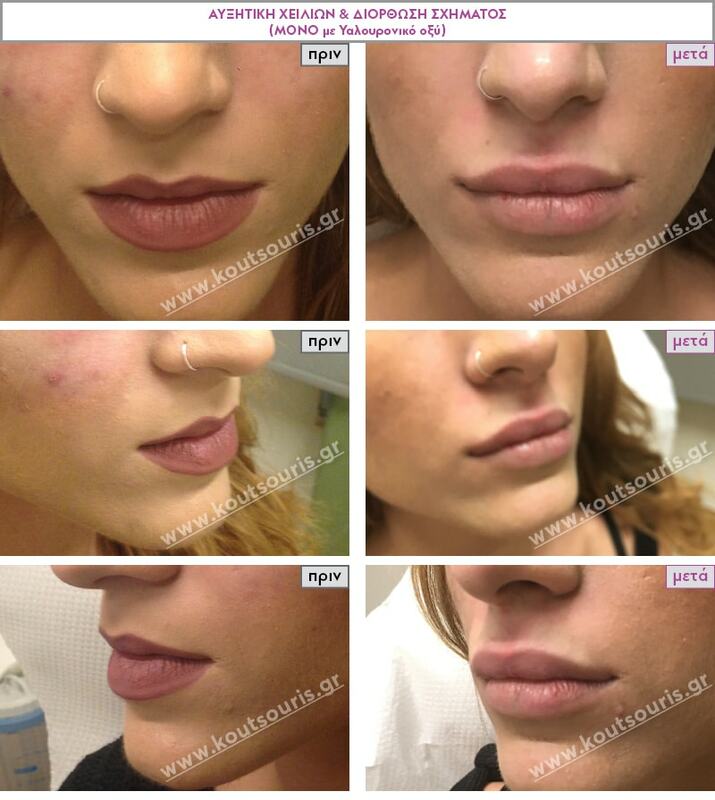 What is the procedure of augmentation / correction of the lips by using Hyaluronic Acid? address to a plastic surgeon, who has a great experience and familiarity with those techniques as well as a in-depth knowledge of anatomy. In addition to Hyaluronic acid can we increase the lips using another material, promising more permanent results? Injection of other types of injectable implants such as that of the Calcium Hydroxyapatite. Despite the fact that the above surgical techniques are more complicated and difficult in contrast to the hyaluronic acid implants, their results last longer and are considered to be more “permanent”. The non-existence of an ANTIDOTE is the biggest disadvantage of the permanent lip augmentation techniques and consequently a situation may be irreversible in case of unpleasant results. Are these “more” permanent techniques safe for the lip augmentation? These techniques are certified and tested in Plastic Surgery for a long period of time and they are still used by some people. The advantage of these techniques is the achievement of long-term results and sometimes more permanent. 2. The recovery time period is quite long, and the area of the lips is getting swelled and deformed. This fact keeps us away from the social life, even for months (one cannot exit from his/her house the next day). 4. 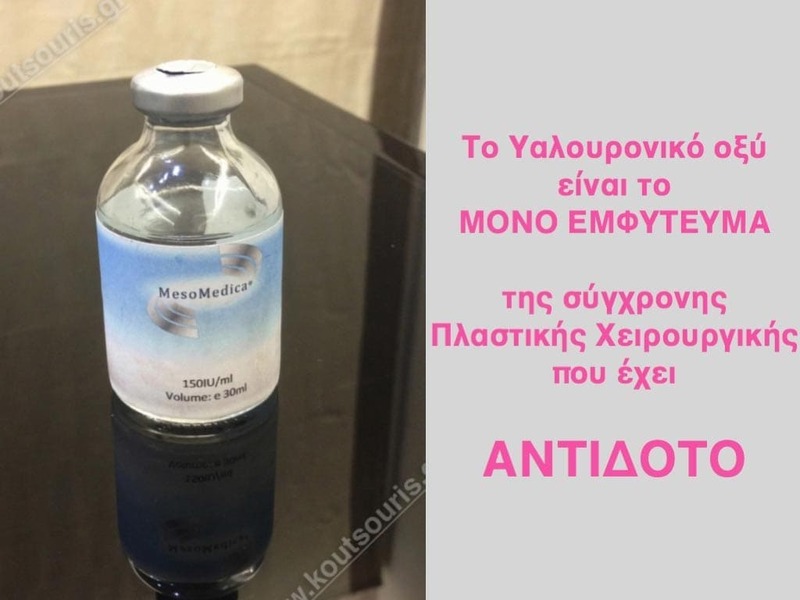 There is no injectable antidote. So, in case of removing a part of the implant, it has to be surgically treated. How can the malformations of famous people’s lips be explained? These malformations of the facial features are usually a result of the permanent implants such as the liquid injectable silicon, paraffin and acrylic spheres. THESE IMPLANTS ARE STRICTLY PROHIBITED. The permanent lip malformations are not due to the Hyaluronic Acid, since there is an antidote in order to easily correct any technical mistakes. Why should I prefer the Hyaluronic Acid lip augmentation instead of the more “permanent” solutions? The invention of the Hyaluronic Acid is a great innovation concerning the lip augmentation techniques. The safety, the ease of application, the long-term duration as well as and the absolute predictability of the results provided by the Hyaluronic Acid outweigh compared to those of other permanent techniques. As it has been already mentioned, the most permanent solutions do not have an antidote. Considering that our facial features change over the years, a permanent material does not follow up the tissue changes, causing deformations. To sum up regarding the issue of lip augmentation technique if the doctor does not have in-depth knowledge of the anatomy or a high understanding of the aesthetics or if he is affected by unreasonable demands, the results may vary from the desired ones or to be destructive using permanent materials used. “Less is more”. The lip area is located in the center of the face. It has special anatomy and aesthetics in relation to other regions of the face or body. In case of lips every good or bad result seems more “intense” than in other parts of the body or face. and of course a …beautiful smile.